Some cuisines are forged through the fire of time, and have deep cultural histories. Europe is old. Asia is older. And experiencing these foods in their native lands is perhaps the best reason for international travel that I can imagine. America is much, much younger. However, that is not to say we are without our regional cuisines pegged to history. Southern food may put you in a diabetic coma, but it’s marvelous. Other regional American cuisines have ties to long established immigrant communities, like the Pennsylvania Dutch. Regional cuisines, don’t appear overnight. As much as I might wish the Upstate New York had a regional cuisine all its own, it cannot be willed into existence. But there can be small events that light a spark, which then inspire others to fan the flames, and eventually, over time, grow into the creative fire of a new cuisine. Jeremiah Tower is widely credited with creating the spark that would become California Cuisine at Chez Panisse back in 1976 with a single dinner. It was a celebration of local ingredients, simply prepared, and paired with regional wines. Back in the day, this menu cost $20 and the wine pairing was $7.50. Just using a basic inflation calculator, that would translate into $85 and $32 respectively. My understanding is that the wine was quite a bargain for the bottles being poured, and in fact, that was a large part of the draw for chef Jeremiah’s dinners. You may notice that while this menu may have been the launch pad of California Cuisine, it does not include what may have turned out to be the most iconic dishes of the form. There is no baked goat cheese salad. There is no wood fired pizza. I suppose you could even argue that there is nothing about this menu that is uniquely Californian per se. Sure, everything comes from California sources, but the vast majority of ingredients could be found up along the Pacific Coast (except for of course the wines). And while the kitchen at Chez Panisse was focused on French techniques, there are also Italian flavors woven into this menu, most notably in the cheese course. Vela Dry Jack was created as a Parm-Reg substitute during World War Two, and Zinfandel was pioneered by Italian winemakers and deeply connected to Primitivo. 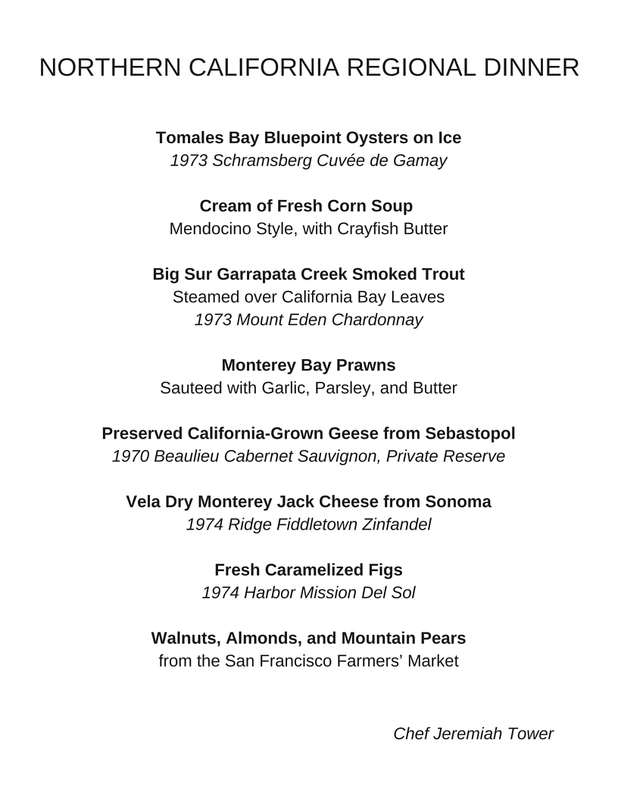 So riffing off this menu as a starting point, here is what chef Brian Bowden put together. There are culinary themes in Brian’s menu that we see in other chefs’ visions of an Upstate New York cuisine. That’s a good thing. The presence of rabbit, duck, and venison, all acknowledge our position amidst the mountains and rivers of Northeast Appalachia. Apples, maple, winter squash, and mustard are also well understood elements that comprise the flavors of the region. When looking at the dishes a little closer, they are largely a blend of Italian and French influences. It may be a bit of a stretch, but Albany county was originally settled by the French. And it should be quite clear to even a casual observer, how dominant Italian food is in the culture of the region today. 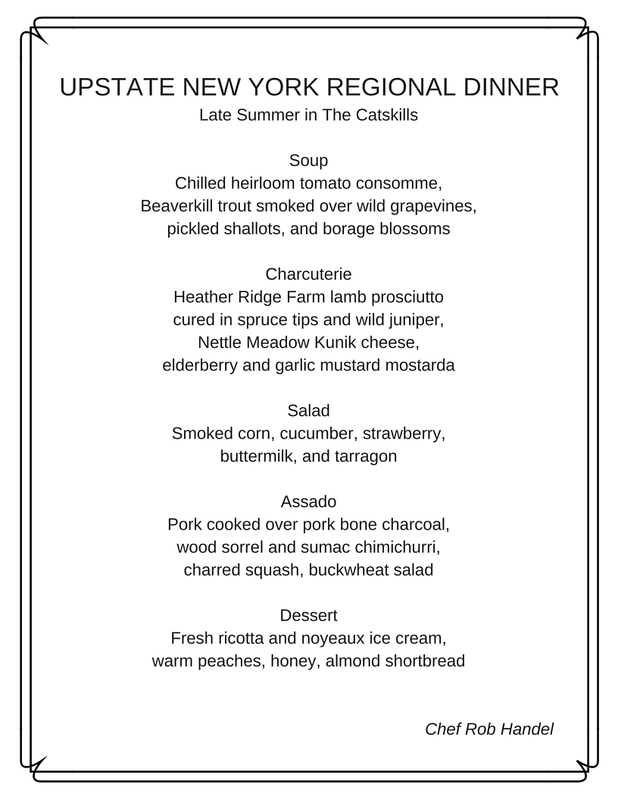 Chef Rob Handel from Heather Ridge Farm took a more focused approach and came back with a menu entitled, Late Summer in The Catskills. Rob actually cooks like this all the time. It’s part of the challenge of being the chef on a farm. 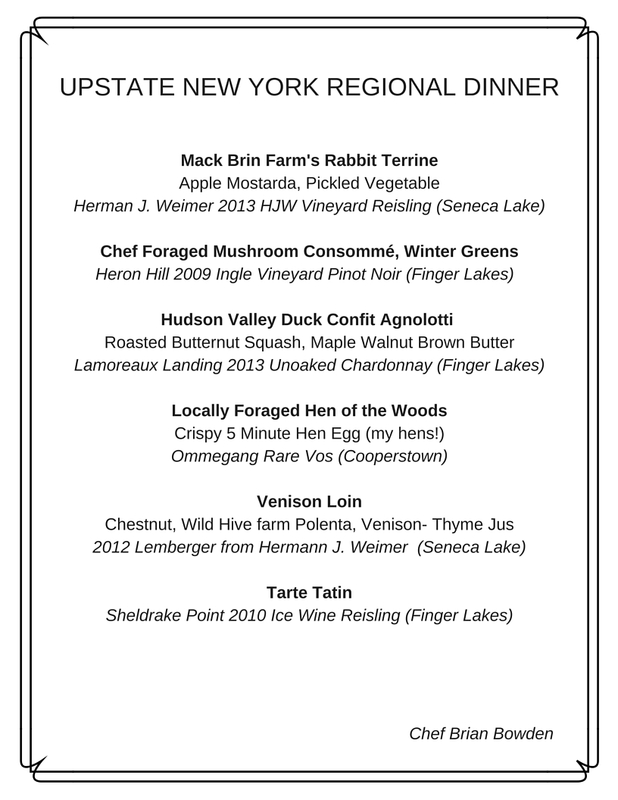 In his menu, we see trout from our rivers, and cheese from one of Upstate New York’s great producers. I’m particularly entranced by his sorrel and sumac chimichurri, which is a very clever way of bringing together these wild ingredients. And the fact he uses the almond flavored peach seed kernels in the ice cream that adorns the peaches, and then pairs it with an almond shortbread, just fills me with joy. With chef Rob’s creative style, it’s hard to pin down a descriptor for this menu. What this menu has is a definitive, and explicit, sense of place. That place is The Catskills. But more than anything else, I would call his cooking, resourceful. And resourcefulness has Upstate New York written all over it. The chefs over at Dali Mamma in Albany had a lot of fun with this project. 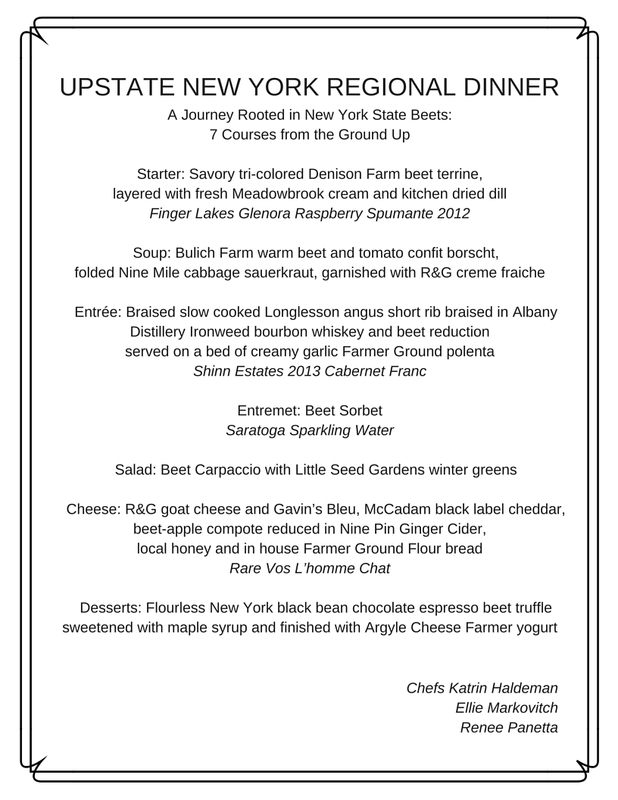 They put together almost an entirely vegetarian menu highlighting one iconic Upstate New York vegetable: the humble beet. There is a lot of love for local producers in the seven dishes of this menu, including Meadowbrook dairy, R&G cheesemakers, Albany Distilling Co., Saratoga Water, Nine Pin Cider, Argyle Cheese Farmer, and more. Then there are all the local farms used in every single dish. Remember, the idea here is not to present Upstate New York Cuisine for what it is. Because as of now, it doesn’t really exist. Rather, this was a thought exercise to express a vision of what the could be. There are four more menus that try to answer this very same question over at All Over Albany, along with more commentary on the common threads that tie everything together. One additional chef is actually cooking an Upstate New York Regional Dinner this weekend, and he promised to send me pictures for a follow up post next week. I’ve also agreed to post any further menus that chefs may create inspired by this idea, on the FLB. Taken as a whole, these menus start to paint a picture. Perhaps even more important than the menus will be people’s reactions to them, and where things go from here. But what’s extraordinarily encouraging is the enthusiasm for this project among the chefs who I asked to participate. Thanks to all of them for putting thought behind this. I think we’ve definitely achieved a spark. Now the next step is to see if we can fan the flames. I think these are even better than the menus on AOA. Heather Ridge Farms menu sounds amazing. I dunno. Don’t get me wrong, all of the menus look fantastic and the offerings sound amazing, but how much does rabbit terrine, buckwheat salad, or short ribs really speak to this area? Take out the local provider’s name or the obligatory “Hudson Valley” and you could be anywhere in the U.S. Locally sourced ingredients are part of it, but not all of it. I’ve always been a big advocate “of place” in beer. Not terroir, or even appellation–but rather an association or connection to locality. The best example I can think of is Alaskan Brewing Company’s Smoked Porter. They use alder wood to smoke the malt–the same wood often used to smoke salmon up there. To you and I the smoke is just a great addition to the Porter, but to the folks in Juneau, there’s a true connection and familiarity to Alaska. Also, there’s no nod to history. I wouldn’t expect that history to be the focus, but our history is part of our culture its part of what frames “upstate”. Cookies, potato chips, beer, classic Italian, hell even NEBA roast beef and fish fries—those items are all part of who we are, and there’s a thousand ways any and all of those could be re-inerpreted—in spectacular fashion—on a representative menu for today. This is a huge topic, and it’s challenging to split it up over a couple of blog posts. Invariably some things will fall through the cracks. In today’s post, I very briefly mentioned the idea of Northeast Appalachia. Just eyeballing a map of that larger geological sub-region, “Upstate New York” makes up a plurality, if not a majority, of the land area. With all due respect, these menu could not actually be from anywhere in the US. There is nothing coastal about it. Nothing southwestern. Nothing remotely southern. These menus are all about mountains, streams, fields, and forests. That said, I would concede that they would fit nicely within Northern PA, Western Mass, and Vermont. Largely, that’s because these political boundaries artificially carve up the region. Northern California is largely an island unto itself, so in some ways, the task of defining its cuisine was a bit simpler. The important thing to keep in mind, is that these menus are a starting place, and not an end point. These are the first stabs at something that’s truly yet to be defined. And I think that if people are open to the idea, and keep pursuing what it means for something to be part of an Upstate New York Cuisine, that eventually we’ll get there. But I do think it can be done without reinterpreting tavern food with better ingredients. I think it can be aspirational. I think we’ve got great raw materials to offer, and now I’ve seen that we’ve got some talented chefs who can get us there. I think Craig has some points. I love what the chefs have done and would love for the spark to grow into a roaring cook fire. I want to eat all the things! Also the wine pairings are fantastic, since I’ve tasted all those wines on successive trips to the finger lakes.